I just listed this little 4" x 4" painting on eBay. The secret to this delicious chocolate cupcake are the sweet cherry chips that give this cake a candy bar flavor of days gone by. It is topped with chocolate frosting, whipped cream, and a bright red cherry. I need a chocolate fix now! Really beautiful! And I wouldn't mind tasting one of them too. Very beautiful...pass the chocolate! heehee! 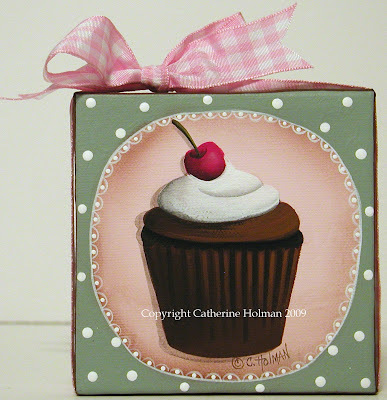 Hi Catherine, ow, you are making me hungry with this one...I love the cherry on top. Too cute, as always - Cathie!! Cathie, you are making me hungry! Very cute! So sweet to look at too. I bet you are a great cook and baker. Your painted cakes make me hungry. yummy yumm. I wish I had a little girl. 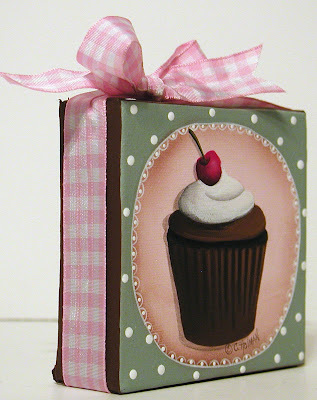 I am a cupcake fanatic and I luv this. I'll have to check out your others and see if there is anything that could fit in with my red/americana kitchen. Oh wow! That is one yummy looking cupcake!